62 MMS January 2017 mmsonline.com QUALITY GAGING TIPS Columnist There are a couple of professional football teams out there who are leading their divisions and whose main driving principles include main- taining a focus on the fundamentals in order for their players to do their best. This same principle can be applied in gaging: Going over the simple basics—sometimes again and again—will enable us in the dimensional measurement world to achieve championship-level results. 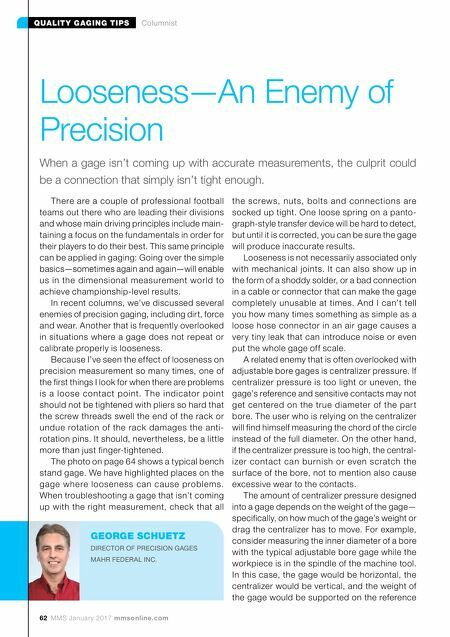 In recent columns, we've discussed several enemies of precision gaging, including dirt, force and wear. Another that is frequently overlooked in situations where a gage does not repeat or calibrate properly is looseness. Because I've seen the effect of looseness on precision measurement so many times, one of the first things I look for when there are problems is a loose contact point. T he indicator point should not be tightened with pliers so hard that the screw threads swell the end of the rack or undue rotation of the rack damages the anti- rotation pins. It should, nevertheless, be a little more than just finger-tightened. The photo on page 64 shows a typical bench stand gage. We have highlighted places on the gage where looseness can cause problems. When troubleshooting a gage that isn't coming up with the right measurement, check that all the screws, nuts, bolts and connections are socked up tight. One loose spring on a panto- graph-style transfer device will be hard to detect, but until it is corrected, you can be sure the gage will produce inaccurate results. Looseness is not necessarily associated only with mechanical joints. It can also show up in the form of a shoddy solder, or a bad connection in a cable or connector that can make the gage completely unusable at times. And I can't tell you how many times something as simple as a loose hose connector in an air gage causes a very tiny leak that can introduce noise or even put the whole gage off scale. A related enemy that is often overlooked with adjustable bore gages is centralizer pressure. If centralizer pressure is too light or uneven, the gage's reference and sensitive contacts may not get centered on the true diameter of the par t bore. The user who is relying on the centralizer will find himself measuring the chord of the circle instead of the full diameter. On the other hand, if the centralizer pressure is too high, the central- izer contact can burnish or even scratch the surface of the bore, not to mention also cause excessive wear to the contacts. The amount of centralizer pressure designed into a gage depends on the weight of the gage— specifically, on how much of the gage's weight or drag the centralizer has to move. For example, consider measuring the inner diameter of a bore with the typical adjustable bore gage while the workpiece is in the spindle of the machine tool. In this case, the gage would be horizontal, the centralizer would be vertical, and the weight of the gage would be supported on the reference Looseness—An Enemy of Precision When a gage isn't coming up with accurate measurements, the culprit could be a connection that simply isn't tight enough. 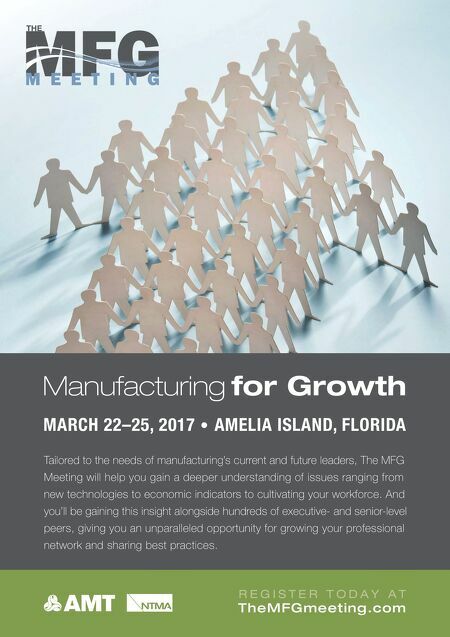 GEORGE SCHUETZ DIRECTOR OF PRECISION GAGES MAHR FEDERAL INC.